I had to look up the definition of ‘ecotourism’ on Wikipedia because I had the suspicion I’d been duped. There we sat on our boat idling on the Grijalva River looking at monkeys lounge in the trees above us. The smell of the burning fuel stung our nostrils as we gawked at the monkeys. They had the better seats to gawk at us, high in the trees of Sumidero Canyon. From San Cristobal de las Casas I got a ride from a tour company to Chiapa de Corzo, where boats sit at the ready. On our drive out of town we pass by one of the numerous EZLN tags on buildings, trucks, sidewalks. Moments later, my view of the tag is obscured by a caravan of military trucks transporting soldiers wielding rifles. Even though there haven’t been any armed conflicts between the rebels and the Mexican government since the mid 90’s, there is still an impressive presence of personnel in Chiapas. We were outfitted with bright orange life vests, a group of probably 15. Mostly Mexicans, a couple of Germans, a couple of Israelis, and one Estadounidense (myself) to round us out. Even though they’re only a precaution, life vests make me nervous. The captain of our vessel looked competent enough, but really I was going to take off that oversized orange mass if we tipped. The moment we disembarked the pictures started snapping. Pictures of everything. The trees lining the river. The bridge going over the river. As a group, we probably came home with hundreds of pictures that will never be looked at again. But we had just started. We weren’t even in the canyon yet. We pick up speed. The German in front of me loses his hat in the wind. His already decidedly German demeanor darkens. His wife is unconcerned. We take a sharp 270 degree turn and stop facing the shore. Up in the trees are those monkeys. They lounge in the trees, as if they are the spectators and we’re the show. People whistle at them – to what end, I do not know. Greenery clings to any possible strip of land in the canyon that will allow it. Only the harsh rock faces that plunge down completely vertical are without it. Trees are filled with spectating monkeys and countless birds. Crocodiles lay on the shore of the river. 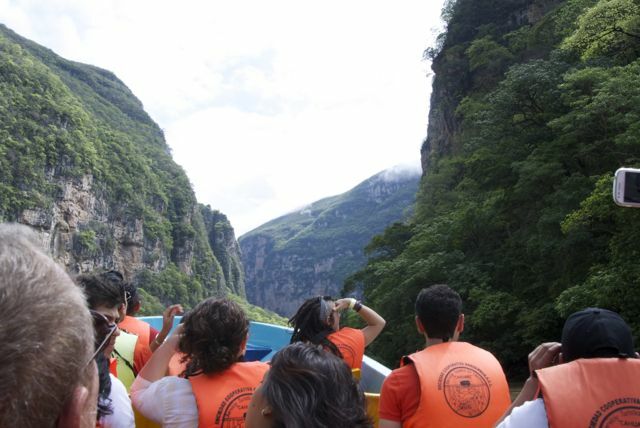 Sumidero Canyon sits in a small wildlife reserve. If one desires, lodging is available there and the boat tour will drop you off right at the dock. I was completely unaware of this, or even the boat ride, because I signed up for the tour blind, having no clue to the activities. I was preparing myself for maybe a hike. Instead, I got the smell of gasoline and giggling high school girls taking pictures of each other. The height of the canyon is breathtaking and passing through it is like a religious experience, excepting the smell of gasoline, giggling high shoolers, and all the plastic bottles floating in the river. I couldn’t help but thinking a kayak would make the experience more eco-friendly and enlightening. But then the guy decked out in Ralph Lauren gear probably would have skipped the whole thing. According to local myth, instead of yielding to the conquest of the Spanish, locals plunged to their death into the river from the peaks of the canyon. I wonder what they would think about the enormous dam or the boat floating around selling snacks, sodas, and beers to tourists. On the way back, the driver of our van stopped in the town of Chiapa de Corzo, told us we had forty minutes to do whatever we want, and took a nap on bench nearby. To keep out the suffocating heat, slabs of cardboard are strewn across the windshields of parked cars. In San Cris, it is raining per usual. This entry was posted on June 8, 2013 by alexjparton. It was filed under Mexico, Travel and was tagged with chiapas, ecotourism, ezln, mexico, sumidero canyon. Great description of the tour! I’ve done it a few times and I usually enjoy it, except for the part where you see the Virgin in the cave full of pure floating garbage. That saddens me. And is not very “eco-tourism-y”. In fact, on one of the tours I was on, a forthright European chided the boatman and his co-op for allowing it to be so filthy and said “This is your business – you need to take care of this environment, tourists don’t want to come and see this.” He made a good point. Thanks for your comment! Plastic bottles are a problem, I’ve noticed, in all of Latin America. Our boat captain did acknowledge it and say they’re working on it. I just wish there were more options for exploring besides the motor boat tours, such as kayaks for no emissions touristing. However, the canyon was breathtaking nonetheless.